The Campaign for a Commercial-Free Childhood has put together a yearly event encouraging children, families, schools and communities to go screen free and make changes toward a more active and outdoor lifestyle. This year the event will happen April 30 – May 6. Tales of a Mountain Mama has pulled together a group of bloggers (including me) to help celebrate with posts aimed at encouraging families to go ‘screen free’ next week. Even though we won’t be going entirely screen free in our house, I’m more than happy to support an effort to get kids and families outside! Sometimes I forget that not everyone is as eager to take their kids hiking as I am. That some parents might be hesitant for any number of reasons to take their kids out on the trail. Hikes with Tykes: A Practical Guide to Day Hiking with Kids was written to help address these concerns and more. 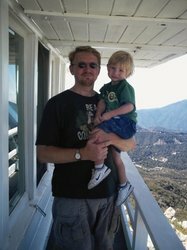 Author Rob Bignell is an avid hiker who’s been taking his young son on day hikes for nearly five years. In that time, he’s acquired a ton of wisdom on the topic. The focus here is not on creating kids who can scale mountains; it’s on learning to enjoy the journey. Hikes with Tykes covers everything from how to find kid-friendly trails to what to bring on the hike and how to deal with tantrums on the trail. Attitude Adjustment addresses the rewards of hiking with kids and offers tips for finding kid-friendly trails. Gear goes beyond the things you think you might already know about clothing and gear, including advice on food and water, maps and more. The Hike includes a packing list, basic trail smarts and etiquette, coping with nuisances on the trail like tantrums, sibling rivalry, boredom and more, PLUS a ton of ideas for activities on the trail. Disasters prepares day hikers for common medical problems, dangerous plants and animals, and unexpected bad weather. Hikes with Tykes is a field manual for day hiking with kids. You can flip to whichever section meets your needs or read the entire book from start to finish. Hikes with Tikes is easy to read and packed with lots of helpful tips and checklists (which you know I love). You don’t necessarily need to read it from start to finish; you can also use it as a reference guide by flipping to whichever section addresses your questions. Guess what? I’ve got a free copy of Hikes with Tykes to share with one lucky reader! To enter, leave a comment sharing one reason you like to hike – or would like to hike more – with your kids. Good luck! This giveaway will run through midnight PST on Sun., April 29, 2012. You must include an email address with your comment. Entries without an email address will not be included. The winner will be chosen using the nifty random number generator at random.org. Winner will have 24 hours to reply to my notification. If I don’t hear back after that, I’ll pick another winner. *Update: This giveaway is now closed. Thank you for all of your wonderful entry comments! 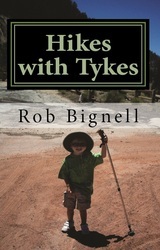 Note: I received a free copy of Hykes with Tykes in exchange for providing my honest review with you. Read my full disclosure policy for more information. Don’t forget! Tales of a Mountain Mama is hosting a different giveaway every day this week, so head on over! And if you’re looking for a fun trail activity for kids, check out OutsideMom.com’s latest idea, creating a kid friendly map. Hi Holly! Thanks for stopping by. Hiking is a fantastic way to get outside exploring nature with kids.<br /><br />Sorry for any confusion, but this giveaway is now closed. MOMomma, please leave an email address to complete your entry. Thanks! I&#39;m always looking for more ways to get my kids outside with me. This book looks like a great starting point for gearing up for some hikes. Thanks for sharing your review of it and bringing it to our attention! We love being outdoors – would love a copy of this book – sounds great! We went hiking today. I enjoy it because it&#39;s a relaxing activity and it gets us outdoors. Mama Ruck, can you leave an email address to complete your entry? Thanks! I would love to hike more with my tykes so that it became a regular event in their lives. I love to hike with my children because it forces me away from my goal oriented, checklist, Type A behavior and forces me into the present where we can walk only 100 feet and feel like we reached the summit. Hi Leah! Please leave an email address to complete your entry. Thanks! My parents hiked with us as children and instilled in me a love and a yearning for nature that I carry with me to this day. I want to pass that on to my children. I feel.as though I have to work especially hard since my husband is NOT a nature afficianado. I find the idea of hiking with two kids under overwhelming and need all the help I can get! We love to get out and explore. The kids enjoy discovering things, and I enjoy the fresh air and exercise. Nature is the great fix-all for a bad day around here. 🙂 kwatrous(at)gmail(dot)com. Looks like a nice book! We do lots of hiking with our kiddo because it leaves us all happier and in good moods. I think fresh air, sunshine, and a building-less horizon are as important to life as healthy food and good sleep. I love to hike with my 5 year old granddaughter. It gives us time together exploring nature, which we both love. We have learned so many things together. We are making hiking our tradition.